Built on the shores of the small Mehaigne River, Fallais Castle is a typical medieval fortress, designed as a square with four towers at each angle and a surrounding moat. The innermost part of the castle dates from the 11-12th century, but most of the edifice was constructed between the 14th and 17th century, and was considerably modified in 1881 (see History below). The seigneury of Fallais belonged to the Principality of Liege since the 11th century, when in 1044, Wazon, Prince-bishop of Liege concedes it to the Beaufort family (see also Spontin, Veves and Freyr). In 1276, Richard II of Beaufort becomes the vassal of the Duke of Brabant during the War of the Cow, and Fallais stayed an enclave of Brabant in the Principality of Liege for some time. In the mid-15th century, Fallais pass by inheritance to Charles the Bold, Duke of Brabant and Burgundy. Fallais Castle was soon to play an important role in the history of the region, as it is where Charles will meet King Louis XI of France and Louis of Bourbon, Prince-bishop of Liege in 1468, which ended up in a war between Liege and the Marquisate of Franchimont. In 1614, Herman of Burgundy raises Fallais to an Earldom. 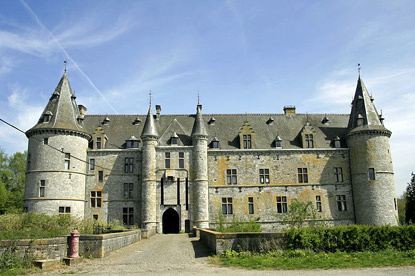 King Louis XIV stayed in Fallais in 1675. Afterwards, the castle was sold several times, and restored by architect Auguste Van Assche from Ghent in 1881-82. In 1937, a fire badly damaged the wooden structures of the castle. Until recently, the castle was open on weekends from 10:00 am to 12:00 noon and 2:00 pm to 6:00 pm, with frequent guided tours. As of 2018, it seems that it is no longer open to the public, but it is still clearly visible from outside. You'll need your own wheels to reach the castle. Fallais is located in the village of Braives on the N64 road between Huy and Hannut. Coming from the E42 (Mons-Namur-Liege) motorway, take exit 7 for Villers-le-Bouillet and the follow the directions for Hannut. Fallais is about 5km from the exit.